1. 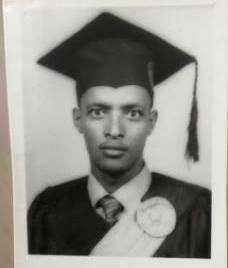 Sept. 2004–Jan 2005 – he worked as unit manager for the maintenance of Arsi-Bale road project run by Oromia Rural Road Maintenance Authority and Ethio-Italian Company. 4. Worked as a project manager for Chawwaqa district head office construction in Ilu-Harari. 5. Oct. 2001–July 2003 site engineer for Siree-Nunu-Arjo Rural Road of Wallaga district. Because of the policy of persecution and surveillance imposed on him, like any educated and entrepreneurial Oromo class as per TPLF’s standing policy, he decided to flee to Kenya for his safety. He sought protection from the UNHCR office in Nairobi explaining his position, and got accepted and recognized as a refugee. However, for unknown reasons, he and his colleague in skill and refugee life, Mesfin Abebe Abdisa, were arrested and eventually handed over to the Ethiopian authorities by the Kenyan counterpart on April 27, 2007, due to the agreement between the two countries. Ethiopia, being a member of the Joint Anti-Terrorism Task Force (JATT), formed under the auspices U.S. that includes Uganda and Kenya as well, continues to abduct Oromo refugees from the neighbouring countries where they sought UN protection, under the pretext of anti-terrorism. The two innocent victims Tesfahun and Mesfin were handed over to the Ethiopian authorities who took them handcuffed and blindfolded at 2:00AM local time on May 12, 2007, purportedly to have them investigated for terrorism at the JATT Main Investigation Branch in Finfinne (Addis Abeba). From Apr. 27 to May 12, 2007, before handing them over, they were interrogated at the Kenyan National Bureau of Investigation near Tirm Valley by American agents and Kenyan Anti-Terror Police Unit. The Kenyan officer Mr Francis, who led the investigation, concluded the innocence of these two victims and requested the Kenyan authority to immediately let them free. However, another Kenyan CID agent Ms. Lelian, who is suspected of having close connection with the Ethiopian agents, opposed the decision and facilitated the handing over of these two innocent victims. Once in the hands of the Ethiopian agents, they were taken to the notorious dark Central Investigation compound, known as Ma’ikelawii, where they were interrogated under severe torture for a year and a quarter. Engineer Tesfahun was then presented before a court of magistrates of all Tigrian nationals in Jul. 2008, who passed the life sentence on him on March 31, 2010. The two were subsequently moved from the maximum security prison to an unknown destination for the pretext of planning to escape. They were taken for further torture in another underground location by a squad directly commanded by the late Prime Minister Meles Zenawi. It was only since last three months that they were returned to Qallitti main prison. The beating was so severe that the engineer repeatedly requested and needed medical treatment which he was of course denied and eventually succumbed to the torture impact yesterday Aug. 24, 2013. Engineer Tesfahun gave his brilliant life to struggle for our homeland and our people. He had a strong belief that despite the darkness of illiteracy, ignorance, brutal oppression and decadence of subjugation imposed on our people under the name of freedom and equality, finally that half of population will be awaken and cross the path towards freedom, democracy and human rights. The enemy was rightly shivering with fear by the love and respect that Tasfahun was creating within the hearts of our people. They knew that within the fire of his fights all the enemies of freedom and democracy would be turned to ashes. He became the worst victim of the vicious systematic genocide against the Oromo.